You know those shoes you grab again and again? The ones you wear everywhere? The ones you love to pieces and hope no one's noticing how often you wear them? Yeah, those are your most versatile shoes. 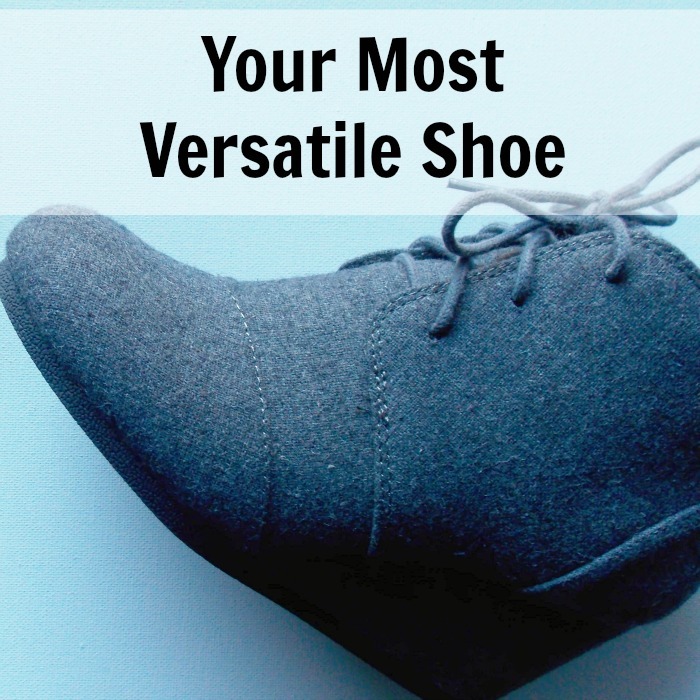 Versatile shoes are the ones that aren't snobby about which clothes they go out with. They're friends with almost every piece in your closet. They're fairly comfortable and broken in. They accentuate your best features. And you love them! The ankle boots (in photo above) happen to be my versatile shoes. They can be grabbed to go with almost every outfit in my closet ~ jeans and tee, go! Top and skirt, go! Casual dress, go! Sweater and pants, go! The importance of a versatile shoe is that, like any of your closet favorites, they give a peak into your style. They show what you love wearing and what clothes you feel your best self in. They reveal your wardrobe values. If you love heels, then you may value looking professional or high style. If you love tennis shoes, you may value agility and the ability to be active. What are your favorite shoes telling about you? What do you value? Once you understand the reason behind your favorite shoes, take another look at your wardrobe. Does it reflect those values all the way through? Are there some pieces that don't fit? Those you can part with. Stick with what you love, it tells the truth about you! I love my ankle boots because they come off professional, go with everything but most of all they are comfortable. Comfort is one of my wardrobe values! If it hurts, it's out. It took me a long time to find ankle boots that worked for me, but when I did, I snatched them up! Once you know what your wardrobe values are, it makes cleaning out the closet easy. It also makes replacing clothes simple. You'll know what kind of clothes you're looking for. Your most versatile shoes are a clue to get you started. What is your most versatile shoe? In warmer weather, my gray chucks. In cooler weather, my black boots. I'm not afraid to wear either one with my maxi skirts! I love that, Rebecca! Maxi skirts are awesomely flexible for that and go with everything!